It’s just a few hours since Philip Auta scored two goals when Enyimba FC won 4-1 against Kaduna United FC in the Nigeria Premier League 2010-2011. Therefore, it seems like good time to present one of my favorite players who are still playing in one of the five countries I write about. Philip Auta is truly a wonderful player with tremendous talent but his career needs to get on the right track – rather sooner than later. As far as I know, Auta started his professional career at Niger Tornadoes FC during the Nigeria Premier League 2005. Auta joined Wikki Tourists FC before the Nigeria Premier League 2006. He participated for the Nigeria national beach football during the season and was also picked for the Nigeria U-20 national football team. Auta had a wonderful season for Wikki Tourists FC during the Nigeria Premier League 2007. Auta participated in trials with Ajax Amsterdam (Netherlands) in October 2007, being described as a “superkid” in various media sources. In December 2007, Auta was part of the Nigeria B national football team. I know that Auta captained Wikki Tourists FC at several occasions. 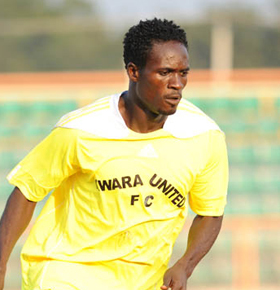 Auta scored one league goal for Wikki Tourists FC during the following season, the Nigeria Premier League 2007-2008. Auta continued to train with the Nigeria B national football team during the season. At the end of 2008, Auta travelled to Sweden for trials at top club Helsingborgs IF. Swedish media described Auta as an extremely fast player and he played a couple of impressive trial matches. I know that several supporters of Helsingborgs IF were disappointed that the club decided not to offer him a contract. Auta did not return to Wikki Tourists FC but instead decided to join the Nigerian powerhouse Enyimba FC for the Nigeria Premier League 2008-2009, scoring two league goals in his debut season and winning a bronze medal with his team. Enyimba FC won the Nigeria Premier League 2009-2010 and Auta was an important part of the team, scoring three league goals and causing a lot of havoc with his effective runs and dribbles from the right-wing. The lively winger was involved in a transfer row between Enyimba FC and Kwara United FC during the early stages of the current season. Apparently, Enyimba FC failed to pay Auta a sign-on-fee they owned him. Auta somehow was able to join Kwara United FC, play a couple of matches for the Ilorin-based side, apparently three, before returning to Enyimba FC in January 2011. At the time of writing, Auta has three league goals to his name in the Nigeria Premier League 2010-2011. Auta also has experience from the CAF Confederations Cup 2008 (for Wikki Tourists FC), the CAF Confederations Cup 2010 (for Enyimba FC) and the CAF Champions League 2011 (for Enyimba FC). Philip Auta is widely recognized as one of the fastest players in the Nigeria Premier League. He is primarily a right-winger, known for his impressive runs, his pace, his dribbles and his ability to tease and torment any defender. He is rather petit but compensates his lack of height with skills and creativity. Auta can also play as a second striker or as a playmaker / attacking midfielder. I have not been able to find the date of birth of Auta. Swedish newspapers wrote that Auta was 20 years old in November 2008. Based on this information, as well as his performances at the Nigeria U-20 national football team, I am pretty sure that Auta is born in 1988. Samson Auta (born 25.11.1985), the midfielder at Kaduna United FC, is reportedly the older brother of Philip Auta. Auta is an experienced performer in local Nigerian football. He is still young and I think mid-level European clubs could make a real scoop if they decide to give Auta a chance. The picture of Auta, wearing the shirt of Kwara United FC, is taken from MTN Football.